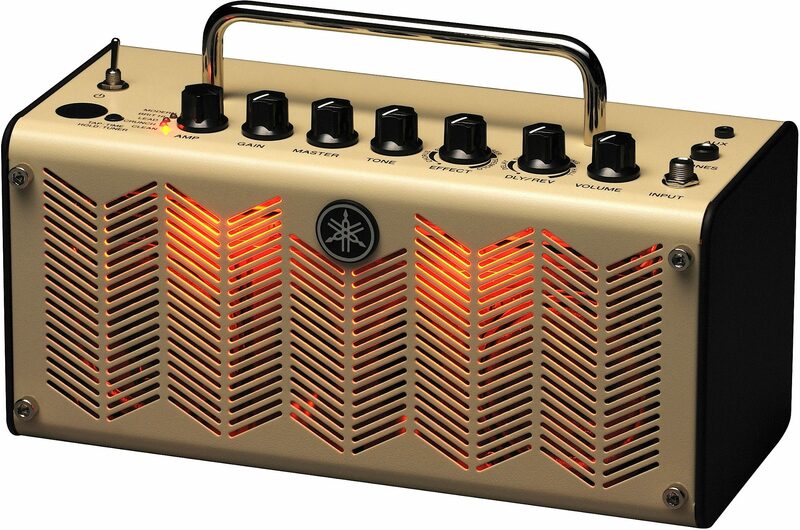 Rock-God Tone Goes Portable With This Desktop Tube-Modeling Amp! With the THR5 Desktop combo amp, Yamaha has created an amplifier that doesn't compromise between accurate tube tone and digital technology. Incredibly portable, and able to recreate the rich sound of an overdriven amp at low levels, it's dressed for all occasions. The THR10 was built for players who want an amp tone that roars -- without having to crank up to a volume that sets off nearby car alarms. Most of the amp's models are crafted to deliver authentic tube tone ranging from clean to British overdrive to modern metal. As you adjust the volume and gain, the THR10's character changes just like a real tube amp would, even at low levels. The THR10 also includes an acoustic channel and flat channel, which offers an unfiltered clean sound. The driver behind the THR5's accurate tones is Yamaha's Virtual Circuitry Modeling. This lends the amp models their convincing tube-like responsiveness, and adds character to the amp's chorus, flanger, phaser, tremolo, delay, and reverb effects. Similar to the amp models, the THR5's effects are made to please players who prefer the feel and sound of analog effects. Yamaha's Extended Stereo Technology helps create a sense of space, and helps reverb effects sound especially deep. It may be an excellent bedroom amp, but the THR10 doesn't have to stay put. With twin 8 cm full-range speakers housed in a 10"x6" chassis, the THR10 is ready to be picked up and taken anywhere. It can be powered by an AC adapter or AA batteries, so it's ready for camping. Jammers will love the THR5's USB and auxiliary inputs, allowing for just about any audio device to be played through the amp. 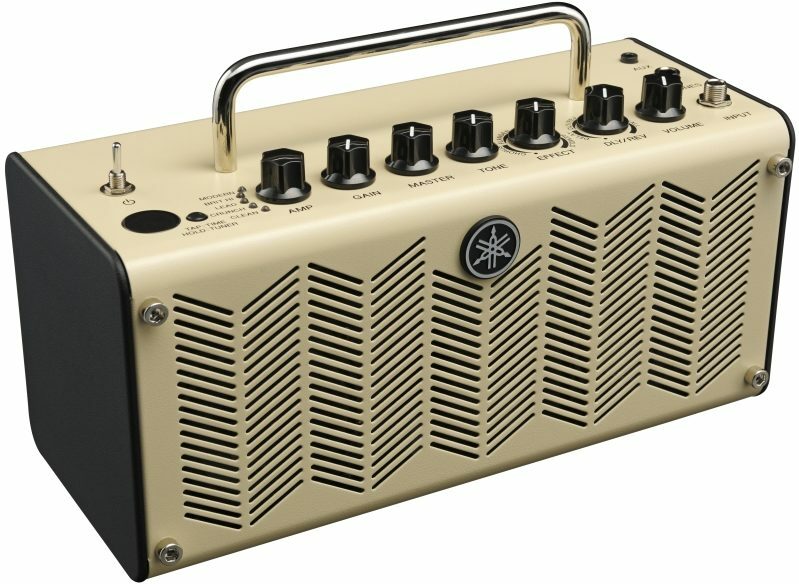 It's also got USB output -- so it's easy to record this amp's big sound directly to your computer. Cubase AI is included, bringing you one step closer to your dream home studio, and the downloadable THR editor opens the door to new sounds and even further amp tweaking. 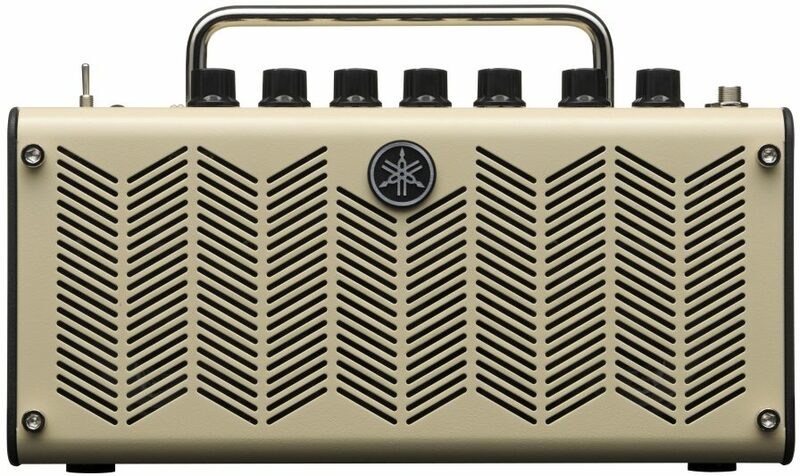 The Yamaha THR5 -- it's a pretty big deal in a very small package. Developed by a team of guitarists in search of the ultimate tone, the Yamaha THR5 delivers the sound that you want and the feeling that you need. Effects that enhance and complement your playing combine with room-filling reverbs and delays to push your playing to greater levels. 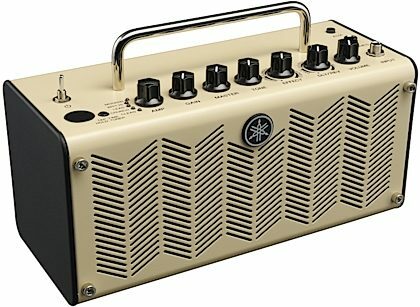 And thanks to the Yamaha THR5's unique design and focus, stadium-filling volume isn't a pre-requisite - everything about this amp is designed to fit the way you play, right down to the need to keep it quiet sometimes. With tone and feel like this, you'll appreciate the ability to keep playing all night! THR was developed with Yamaha's award-winning AV division to offer true hi-fi stereo sound and a greater experience in guitar amplifiers. The exclusive, specially designed speaker enclosure is optimized to handle both guitar and stereo playback sounds making THR uniquely capable of giving you amazing tone for both your guitar and your track from a compact, portable amp. "The ultimate home and studio amplifier?" Overall: I just got the little thing and played with it for a while and I am in awe. The tiny retro-designed package includes everything a guitarist needs for indoor guitar playing and recording! The sound is clear, crystalline and rings in a wide range of frequencies making it hard to believe this quality tone eminates from such a tiny box.The various tone-tweaking effects and controls run a full gamut as might be expected from a high-end multieffect and not a home use oriented amp. Combinations of amp model with modulation and reverb-delay effects - all at professional level allow almost endless sound options. I own an electric with a piezo circuit and it handles the 'acoustic' tones in stride - ringing like a true acoustic. Switch to the magnetic and turn the knob to brit asmp model and I got searing lead and hard-rock tones! Amazing versatiliy.I also tried to use this amp as a pre-module or an effect for recording direct into a multi-track - works wonderfully with stereo sound making my guitar fill the soundscape like when using a profesional studio effect rack. In short - A versatile, high quality, multi-use-multi-purpose guitar amp you can use for recording, practice, or playing with friends at home. It can also be plugged through into a PA if you'd like to carry these cool tones to a large gig. An excellent amp! "Great practice amp, good for cleans and Marshall sounds." Sound: For fender cleans- 8/10 For JTM/JMP crunch- 9/10 For JCM800 crunch- 8/10 For Rectifier/5150 sounds- 5/10 For some reason these modeling guys have a hard time getting metal tones (POD HD500, Fender Mustang, etc...). However what this little unit does have over those products is a very responsive "master" knob which gives you that nice powerful overdriven sound at low volumes. My favorite model is the Lead model, just crank the master and it reacts surprisingly similar to my plexi tube amp. Does it sound exactly the same? No, but it is able to get that "tube feel" at low volumes so you don't blow off your roof. Feature: The features are great, the only downside of the THR5 is the single tone knob. They really should have kept a bass, middle and treble on this amplifier. Otherwise the fx are easy to use and you can control everything from your computer. Recording it sounds great (remember it uses hi-fi speakers which translates perfectly for recording), and it works nicely with its USB. It really is a joy to just have the knobs next to you to adjust, instead of having to constantly tweak on a VST or ampsim. Ease of Use: Very easy to use. This is where Yamaha got it right, simple knobs that work like a real amp. No constant fussing to get good sounds. Having everything in one unit that is so lightweight is a big advantage. Quality: No issues so far, even though these are made in China. You have to realize that these days almost all electronics are manufactured in China. From a $2000 dollar computer to a $1 toy watch, it will be manufactured there. I usually trust Yamaha though, they seem to do a pretty good job. Value: I'd say it is a little pricey for a modeler at this wattage, however it does come packed with a lot of features including high quality speakers. I'd say if they continue to support (and update their subpar modern model) it would be worth it. Since my THR5 doubles as computer speakers sometimes, I say it is worth it in my case. Manufacturer Support: Can't answer this as I have had no issues. The Wow Factor: I would say an 8/10 in the wow factor. What is so cool about this unit is how small, but good sounding it is. I really wish I had one of these things when I was a teenager, would have made my life a lot simpler for recording Overall: I've owned my fair share of amplifiers and the Yamaha THR is a great practice amp. It does best with Fender cleans, light crunch and some Marshall sounds (from JTMish to JCM800). If you want it for metal, I wouldn't use it. It really does do a nice job of getting that cranked poweramp distortion. I have compared the THR5 to the THR10 and they use the same speakers for the guitar sounds. The THR5 is quite a small unit, but it gets more than loud enough for practice usage. The software isn't overly confusing and is straightfoward to use.